As one who enjoys the pleasures of teatime daily, I have been happy to note that over the past decade or so, the availability and choices of loose-leaf tea have soared. Years ago, when I was a new convert to hot tea, it seemed my options were either English Breakfast or Early Grey. I loved and used both, reserving the bergamot-flavored brew for any cups enjoyed after early morning. As I learned more about the benefits of drinking tea, I began to search out tearooms, where, I discovered, an impressive selection of teas usually could be purchased by the ounce or the pound. From very delicate whites and earthy greens to oolongs and blacks, I have tasted many varieties and enjoyed them all. The serving of tea at a social event or simply for a quiet moment of repose is becoming increasingly popular. The beverage, said to be second only to water in consumption, can be enjoyed alone or with a vast assortment of foods chosen to complement the unique flavor of each blend. Although many facets of the tea experience are strikingly similar—the china teapot, the thin porcelain cups, the plate of scones—there are ways to personalize each occasion, whether serving two or twenty. Tea is a versatile and intriguing drink. Its positive attributes are many: it is available in countless blends and flavors; it can be served hot or cold; it boasts medicinal properties; it inspires tranquility and relaxation. I can’t think of a single negative! And what’s tea without a scone to pair it with? Basic scones are staples of a tearoom’s kitchen. 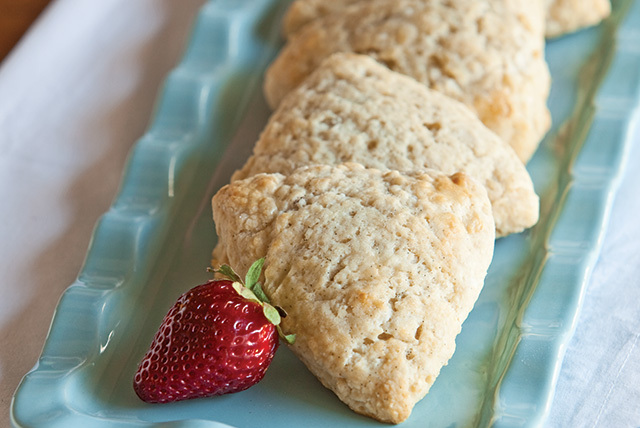 These types of scones do not feature fruit, nuts, or savory additions. Instead, they are unadorned and often only slightly seasoned. Since there is no competing flavor, plain scones are perfect vehicles for showcasing a special spread, such as a favorite jam, unusual curd, or strong-tasting tea. Enjoy this vanilla scone recipe from Scones and Tea, and don’t wait to purchase the entire TeaTime Collection—that’s four beautiful, hardback books—for just $69.99. Hurry, the sale ends Monday night! • Line 2 baking sheets with parchment paper. Set aside. • In a large bowl, combine flour and sugar. Using a pastry blender, cut butter into flour mixture until mixture resembles coarse crumbs. Set aside. • In a medium bowl, whisk together buttermilk, cream, egg, vanilla extract, and reserved vanilla-bean seeds. Add to flour mixture, and stir until dough is just combined. (Dough will be sticky. If mixture seems dry, add more cream, 1 tablespoon at a time, until a dough forms.) Divide dough into 2 balls. • On a lightly floured surface, roll half of dough into a 6½-inch circle. Cut into 6 wedges. Repeat process for remaining dough. Place on prepared baking sheets. • Brush scones with egg white, and sprinkle with vanilla-flavored sugar. • Bake until lightly browned, 9 to 11 minutes. *To make vanilla-flavored sugar, place 1 vanilla bean in a zippertop plastic bag, along with desired amount of sugar. Seal bag, and let sit until sugar has absorbed vanilla scent, approximately 24 hours. Since moving to a colder climate my tea drinking has definitely increased, along with my teapot collection. I love homemade scones but don’t make them too often. For Christmas I made my own version of vanilla bean scones but instead of baking them, I froze them and gave them as gifts. My favorite teas are sold by a lovely woman in Washington; Amy Lawrence has an online store called “An Afternoon to Remember” this site also has lot of delicious recipes. I have a few favorites, including “Southern Hospitalitea, Pumpkin Creme and Caramel Pecan Pie. 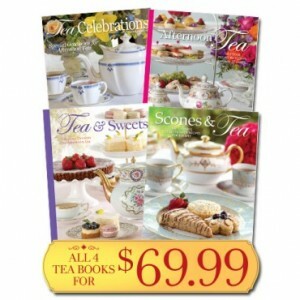 I love The Tea and scones book. My favorite one this time of year is the Peppermine scones with the peppermint cream. I take this to a Christmas tea my friend gives gives every year. They are a big hit. Growing up, we only had hot tea at fancy tea parties, with all the good silverware and china in someone’s home. Usually to honor a bride to be, or something like that. it was very good, served in beautiful china from a silver service, in a beautiful Victorian home. We had dinner at noon, supper at night, and Lunch in the afternoon, about 4 p.m. Many of the ladies spoke German and had wonderful spreads. During the war, they saved their rations for food so they could have the sugar they needed for their Lunches and parties. Thee were lunch meats, ham, homemade bread, coffee cakes, relishes and jellies, churned butter from butter molds, cookies, pies, cakes, coffee, milk with real cream, etc. Some ladies still cooked on wood stoves and did all their own gardening and work. Sometimes, we had tuna fish sandwiches, chicken sandwiches, pimento cheese sandwiches, chips, cakes, pies, cookies, and, of course, coffee. I still feel like, when I smell coffee, there should also be tuna fish sandwiches! I thought that , maybe that was more of a German tradition, to have lunch, like the English heritage had tea in the afternoons. Some of the ladies at the Lunches were not of German heritage, but were neighbors and friends. I was young and in school, and I would sit on the steps and eat cookies and drink milk, after school, while the ladies sat at the table and visited. I was very uneasy when they would speak German. For this was war time. I feared that “they”, whoever that might be, might come an take usall away if “they” heard German being spoken. That fear kept me from learning any German when my great aunt wanted to teach me! Now that she is gone, I wish I had learned. In college, I had a roommate from Vermont. She told us abouthow it was in the north, so different from Texas. She told us that, if we were up north an ordered tea, it would be hot tea, not the iced tea we would get in Texas. We thought that was just for tea parties, or maybe if you were sick with a sore throat, etc. Glad to see a scone recipe. After I retired, I decided that I was going to get up early each morning and bake something for my grandsons before they went to school each day. Some days, I made a normal breakfast. But I decided to make scones one morning. Started at 4 a.m. When it was time for them to leave for school, I had the biggest most sticky mess you ever saw! They went to school, and I kept adding flour, dry ingredients, and kept working that dough all day. By the time the got home from school, I had something that looked and tasted like scones! I added a little vanilla ice cream, and that was better. Youngest grandson liked them, oldest didn’t. I was exhausted and decided that was too much for me! The boys ended up with a Pop Tart and juice for their breakfast that day. And I was worn out! I still would love to be able to bake things for them, although they don’t want to eat what I cook anymore. They are older now and would rather just drive through for fast food. Thanks for the scone recipe. Maybe this one will work better than the one I tried before! Thank you for the scone recipe…I drink tea all day long…i also take a pause during the afternoon no matter where I am or what I am doing and I sit down to a lovely cup of tea and some kind of treat…bliss. When the tea has been enjoyed, use the leaves to feed your azaleas and familiar. Double the fun and beauty. My heritage is Irish. I was raised on Tea. However I did not seriously start drinking it until I was 3o. Not very popular 30 yrs. ago. I am now a very serious tea drinker, no coffee only tea. I love all things to do with tea. I have a beautiful collection of teapots including my great-grandmothers’ and grandmothers ‘ teapots from Ireland. I also have a beautiful collection of teacups, saucers, and dessert plates. I have everyone of your books published about Tea have all my Victoria issues since 1989 and every issue of TeaTime since it started. Many others books, plaques, quotes, spoons etc. to do with Tea. I thoroughly enjoyed reading Laura Childs Indigo Tea Shoppe Mysteries. As a matter of fact ,before I read this I just took some muffins out of the oven from a recipe in one of her books! “I’m glad I was not born before tea”! !